A long time ago, the city of Edinburgh was known as “Auld Reekie.” This was back in the days of peat fire smog, overpopulation, and a lack of modern plumbing. Add to this a stagnant Nor Loch (which was polluted with everything from waste to dead bodies), and you probably can figure out where the “Reekie” came from. Thankfully, Edinburgh has come a long way since then. I'll never forget my first trip to Edinburgh. It was at the tail end of my very first trip to Europe, and I arrived on the train from London right smack in the middle of the city's festival season in August. I hadn't done my research beforehand, and was totally surprised by this timing. It was great, though – I explored the city AND enjoyed the Fringe Festival at the same time. It was on that first trip that I totally fell in love with Edinburgh. The city is filled with history (both its Old and New towns are UNESCO World Heritage Sites), amazing architecture, plenty of Scottish culture, and not one but TWO castles! Edinburgh's most famous attraction by far is the Royal Mile. Though “attraction” isn't really the right word, since the Royal Mile is so much more than just a singular thing to see. You can't miss this 14th-century cathedral with is crown-shaped steeple on the Royal Mile. Not only is the church beautiful on the outside, but it's just as pretty on the inside, too. Pop in to see the stained glass windows, pretty blue ceiling, and intricate Thistle Chapel. Near the Edinburgh Castle, you'll come upon the Scotch Whisky Experience. Even if you don't love whisky, this is something worth doing. If you're in the mood for a more fun way to spend an hour or two, check out the Camera Obscura and World of Illusions right next to the entrance to Edinburgh Castle. This interactive museum is filled with optical illusions and fun puzzles – and the tower gives you some great views out over the city. You can't really visit Edinburgh without visiting a castle (after all, remember that there are two of them here!). Edinburgh Castle, sitting proudly at the top of the Royal Mile, is the castle that you'll see the most often since it's visible from many parts of the city. And while the ancient fortress is pretty cool, I find the entrance fee (currently £16.50) a bit steep for what you can actually see. 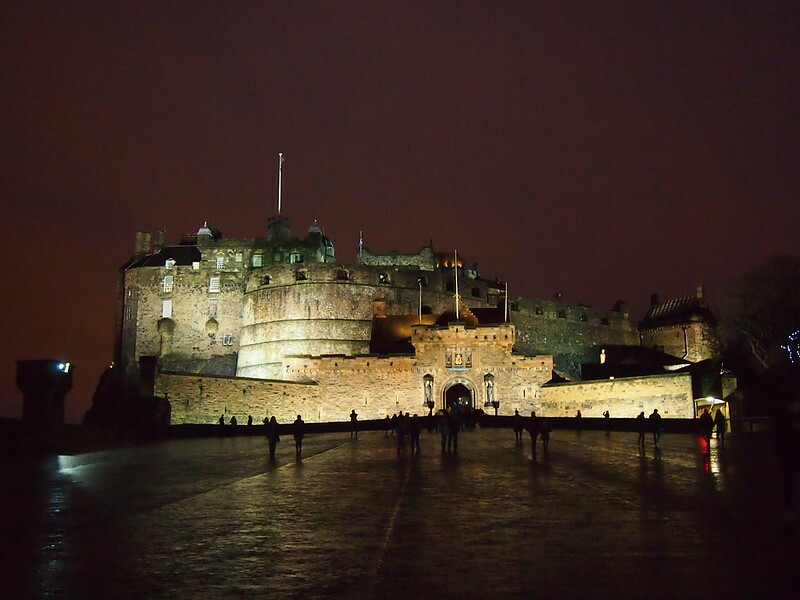 Edinburgh Castle has not been occupied for centuries, so what you'll find inside consists mostly of the crown jewels of Scotland and some military exhibits. If you want my honest opinion, I think that visiting the Palace of Holyroodhouse is more worth it. This palace at the bottom of the Royal Mile only costs £12.50 to tour, and offers the added bonus of still being an official royal residence. Holyroodhouse is the official residence of the British monarch in Scotland, and the Queen comes to stay (and throw a huge party) every summer. You can view the State Apartments (which are still used), as well as the former chambers of Mary, Queen of Scots. When I visited, they also had a special display of some of the dresses Queen Elizabeth has worn throughout her reign. Outside the palace, you'll find some beautiful grounds, as well as the ruins of the Holyrood Abbey. This was all much more interesting for me than Edinburgh Castle. Edinburgh has a very long history – and not all of it nice. There are various tours you can take to explore the darker side of the city, from nighttime ghost tours to after-dark historical tours. You should also check out the Real Mary King's Close, which is a complex of narrow alleyways partially hidden beneath the Royal Exchange in the Old Town. The area has plenty of dark stories associated with it, so be prepared for some goosebumps. On your second day in Edinburgh, venture away from the Old Town into the newer parts of the city. Gotta leave the Old Town behind today. Start you day with a visit to the Scottish National Gallery, located on The Mound beneath Edinburgh Castle. The best part about this museum (other than the great artwork)? It's free to visit. The Victorian Gothic monument dedicated to Scottish author Sir Walter Scott sits on the edge of Princes St Gardens, and is one of the largest monuments to a writer anywhere in the world. It's not an easy climb (it's 287 steps up, and includes some extremely narrow passages), but climbing to the top of the Scott Monument will get you some of the very best views of Edinburgh. Located beyond the east end of Princes Street is Calton Hill, where you'll find various monuments (like the Nelson Monument and Robert Burns Monument) and some more incredible views out over Edinburgh. If you don't fancy climbing the Scott Monument, definitely make sure you get to Calton Hill for the views. Lastly, walk through the New Town on foot to visit one of my favorite spots in Edinburgh: Dean Village. 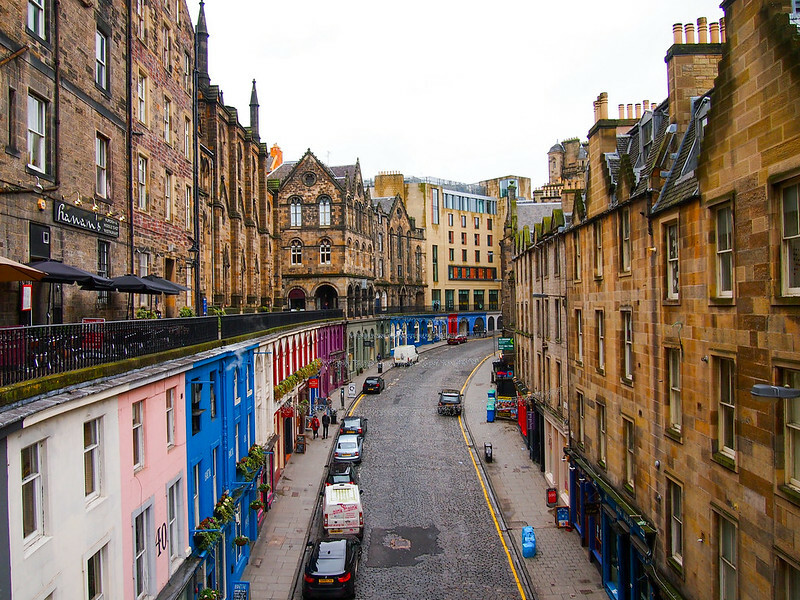 This little neighborhood is characterized by colorful historical houses and the Water of Leith running through it. It's a great place for a walk – but beware that you'll feel like you've stepped back in time here! To find Dean Village, take Bell's Brae down beneath the Dean Bridge, only about a 10- or 15-minute walk from Princes Street. I'm dubbing your third day in Edinburgh “History Day,” because that's what all my suggestions for today seem to focus around. Start your day with another museum: the National Museum of Scotland. This museum is dedicated to the history of (you guessed it) Scotland, but has exhibits covering things like art, design, world cultures, and even dinosaurs, too. And, like with most museums in the UK, this one is also free. This may sound a bit weird, but I really enjoy visiting old cemeteries when I travel. 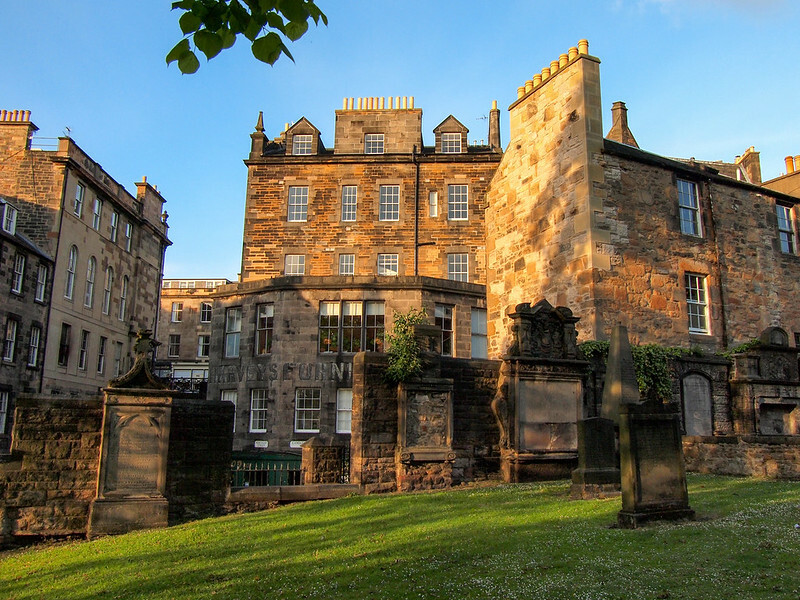 They can be hauntingly beautiful, and this is definitely true of Greyfriars Kirkyard, the graveyard surrounding Greyfriars Kirk in Edinburgh's Old Town. Greyfriars is famous for a couple of things, including Greyfriars Bobby, a little dog that guarded its former master's grave in the graveyard for 14 years. It also is *supposedly* where author JK Rowling got a few ideas for names in the Harry Potter series. Located below the Royal Mile and Edinburgh Castle (on the opposite side as Princes Street Gardens) sits the Grassmarket. This historic market place is now filled with pubs, restaurants, and more of the city's incredible architecture. While you're there, be sure to head up West Bow street, which leads to one of my favorite streets in Edinburgh: Victoria Street. Victoria Street, my favorite street in Edinburgh! Speaking of authors, did you know that Scotland (and Edinburgh more specifically) has produced a great number of writers and poets? Find out for yourself by going on a unique , which will have you tracing the city's literary history by visiting places frequented by the likes of Robert Burns and Sir Walter Scott. Find yourself with an additional day or two in Edinburgh? Then the other must-do in the city is definitely hiking to the top of Arthur's Seat if the weather is good. This ancient volcano sits above Holyrood Park and offers the best views of Edinburgh and the Firth of Forth. The hike generally takes a couple of hours to complete, but you could easily stretch it to a half-day activity if you bring a picnic lunch. This was my view from my Destiny Scotland apartment! For pies: The Piemaker – No, not fruit pies; we're talking meat pies here! The Piemaker on South Bridge serves up cheap and tasty pies that are perfect for a takeaway meal. For soup: Union of Genius – This is Edinburgh's first soup cafe! For pizza: La Favorita – This pizzeria makes great wood-fired pizzas with homemade dough. 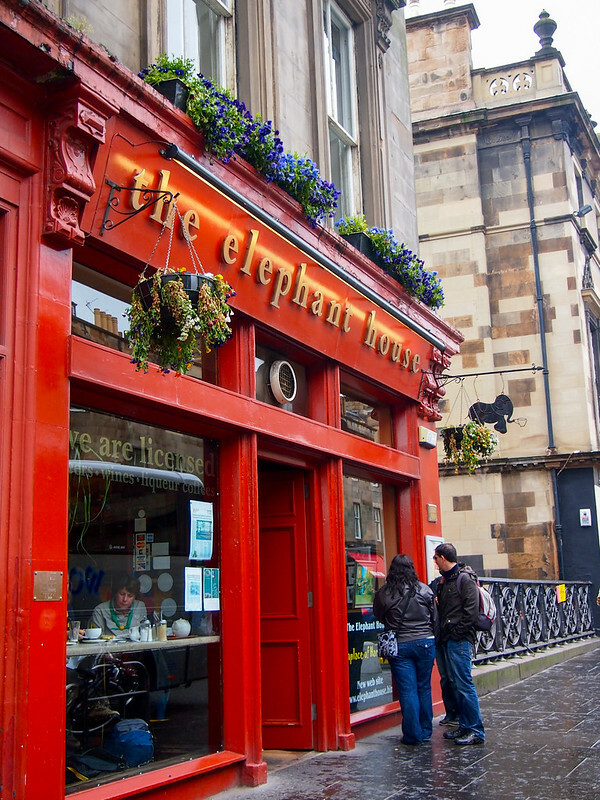 For dessert: The Elephant House – This cafe on George IV Bridge is famously known as being one of the places where JK Rowling would write her Harry Potter stories over cake and coffee (or maybe tea?). They do very tasty cakes and desserts. For serious foodies: The Kitchin – This Michelin star restaurant has a “from nature to plate” philosophy, and serves up British/Scottish cuisine French-influenced flair. Looking for packing suggestions for Scotland? Head over to to see all my favorite travel gear! Is anyone else as in love with Edinburgh as I am? What are some of your other favorite things to do there? I’m so glad you experienced La Favorita!! We order from them all the time. Best pizza ever. Piemaker is great as well! Pass on the Elephant House. If you really want to see where JK Rowling did loads of her writing, go to Spoon on Nicolson Street – her brother in law used to own the cafe that has now become Spoon, so she spent a lot of time there. I also think their coffee/food is much tastier than Elephant House’s. Good tip on Spoon! The apartment I stayed in the last time I was there was right above the Elephant House, so it was cool to just pop down there for dessert in the evening! This is great! 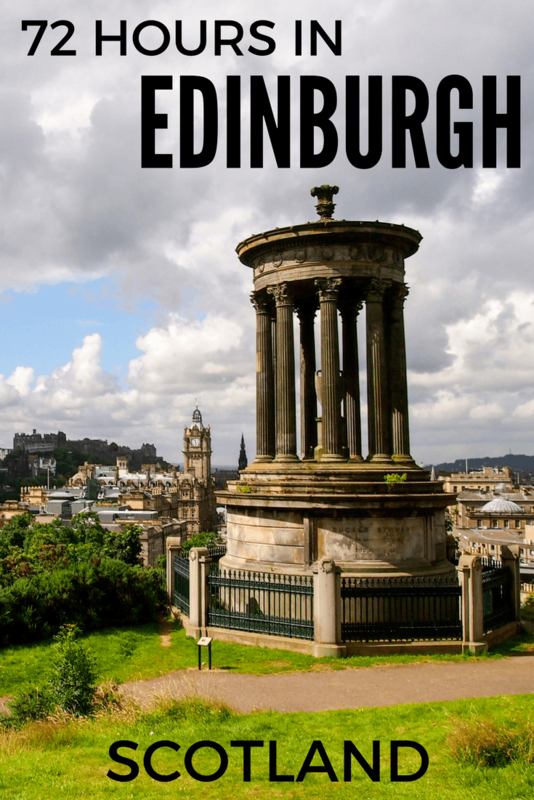 Edinburgh is on my bucket list – hoping to get there soon! I hope you do! It’s a very cool city. My hubby & I have been lucky enough to get to Scotland twice. We’ve done several of your suggestions. Edinburgh is one of my favorite places. I’d love to go back. Take in the annual Tattoo if you get the chance. You can view it on Utube, but it’s better to be there. You have given good advice. I saw the Tattoo a few years ago, and it was indeed amazing! There’s so much to do there during the Festival season. You nailed it 🙂 Edinburgh is one of my favourite cities in the world – it’s actually beautiful in every season. This itinerary is about the same I always tell people to do in Edinburgh. I’ve been there in summer, winter, and autumn, and have to agree – it’s a great city any time of year! Edinburgh’s one of my favourite cities, the history is just fantastic! And the ghoulish side of tourism is one of the cities strong points; underground cities, ghost tours and castles with a bloody past – it ticks all my boxes! I’m a huge history nerd, so I know that’s definitely one of the reasons why I love Edinburgh so much! Great guide! I’m visiting Edinburgh for the first time in February, and will definitely be using this guide to help plan my trip. Yay! Happy to be able to help! These pictures make me want to go to Scotland very much now! I just got inspired to go to Europe, hopefully it works out, but Scotland is one of the places I’d want to go. Scotland is one of my favorite parts of Europe – and Edinburgh can’t be missed! Great guide! LOVE LOVE LOVE Edinburgh! One of my favorite European cities! It’s one of my favorites, too! No matter how many times I’ve been there, I always love going back. Nice post! I’ve dreamed of going to Edinburgh, but I wasn’t sure at all if I was going to like it. However, seeing your photos (and reading your blog) makes me wanna pack my bags and go to there. It’s a cool city for so many reasons – I would definitely recommend visiting eventually! I love these photos. I’ve always been meaning to get to Scotland… just haven’t prioritized it, I guess! If I do go, I would probably have exactly 72 hours, haha! There’s just so much to see in that part of the world. Luckily Edinburgh is a fairly small capital city. You can see the main sights in just a few days, and you can even get to most places on foot (especially in the Old Town, where things are quite close). Highly recommend the train! You see some very pretty scenery on the way, and I find train travel so much easier than flying! I love this post! It actually couldn’t have come as a better time as I’m off to Edinburgh next month and am finally planning to be a tourist! I’ve always gone there to see friends, or go to a concert, or twice I’ve managed to swing by during the Fringe and still not done anything touristy beyond the Royal Mile. I’ll be doing Arthur’s Seat on my first day though, for me that’s a must-do! And the zoo is on my list. But I love your other suggestions! I can’t wait to visit Scotland…not sure it will happen this year, but I’ll definitely come back to this list before I do! It certainly is one of the most photogenic cities I’ve been to! And not one but TWO castles? Definitely fairy tale stuff right there. Two other places worth seeing…The National Library of Scotland is near the Elephant Café. It has an exhibit space featuring rotating exhibits, café, and bookshop on the ground floor. When I visited last year, there was a neat exhibit about maps in history. I also had a wonderful afternoon at the Scottish National Gallery–lots of great art! 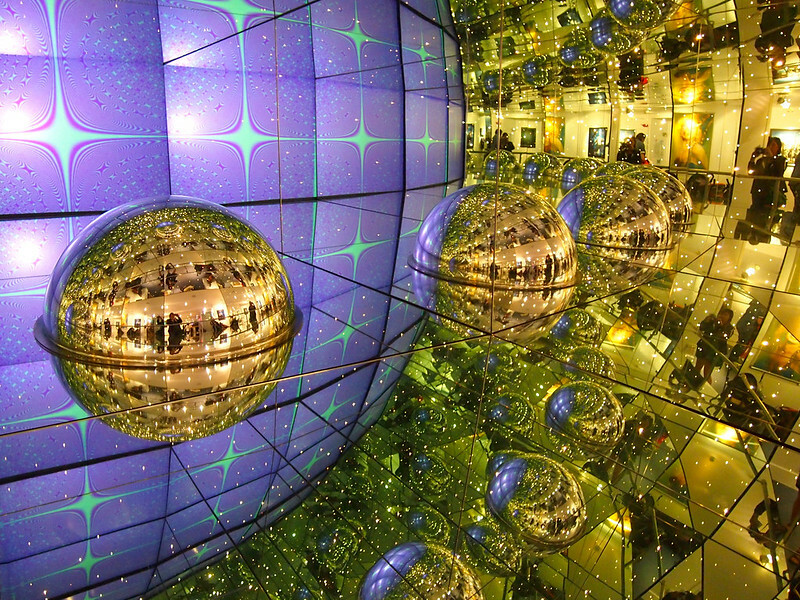 Lots of great museums, for sure – which are especially great for a rainy day! ‘Love the post Akatuki. You did very well! As a British person who has been to Edinburgh a million times, you pretty much covered it lol! All I would ask is that you find yourself a venue with live music, and to do so all you need look for is a local pub! In short, the Scots are warm, and their country is lovely! I LOVED Edinburgh during the Fringe! There was always something fun to see on the Royal Mile, and I got tickets to a couple very cool shows for really cheap! I even managed to get a last-minute ticket to the Military Tattoo. I would definitely go again! I would LOVE to visit Edinburgh someday. It’s on my list of places to travel. They have so much to see and do and experience! Thanks for sharing this. I’ll be sure to stay at one of the places you recommended! Yes, for a city that’s really not that huge, there really is a ton to do there! Hi Akatuki, I’m from Scotland (East Kilbride, near Glasgow) and I love Edinburgh. This is a great guide from a foreigners point of view. Good job! Beautiful photos from a beautiful city – I love Edinburgh! Thanks! I really love Edinburgh, too! I really loved Scotland and Edinburgh was just soo amazing. I kind of hated Glasgow, but the capital felt like a place where I could possibly live. But mabye that’s because I had three days of sunshine, lol! The weather really can make a huge difference! I liked Glasgow, but Edinburgh definitely has my heart when it comes to Scotland! I’m heading to Edinburgh for the first time in June. Thanks for the tips. This was extremely helpful. Any lovely bookstores you can recommend? I always buy a book or two from wherever I go. So happy to hear this was helpful!! As for bookstores, you’ll be happy to know that there are quite a few independent bookshops in Edinburgh! I’ve been inside Armchair Books and the Old Town Bookshop – both very cool and sell lots of old books! But I know there are lots more! I went to Edinburgh for the first time last summer during the Fringe Festival, and loved it so much, I came back again this summer! One thing that is really fun that is not on your list is to do a Harry Potter tour if you are at all a Harry Potter fan. It was really well done and lots of fun, visiting sites that inspired J.K. Rowling when writing the books, or visiting locations where she actually did some of the writing. For instance, Victoria Street was the inspiration for Diagon Alley. The tour takes you through old cemeteries, through interesting neighborhoods, and is really entertaining. That tour is on my list to do at some point in Edinburgh! This is great. We have less than 48 hours, but it gives us a good idea about what’s worth checking out, thanks. Happy to be able to help! Edinburgh is a great city. I need to visit this place. New years in Edinburgh anyone??? I went from London to Edinburgh with Stoke Travel party train 24hrs, look it up! Definitely worth it. Best NYE ever, loved Edinburgh. Great article, I been in UK and was living there 8 year but never get chance to travel to scotland. but i think coming year i will make a plan to travel there. Thank you for sharing and i will follow your step. You should definitely go! Scotland is great. Glad to hear this post was helpful! В интеренете нашел важный портал с информацией про покраска ресниц цена.